From embracing the country's first sunshine at Fuyuan, the most eastern part of China, to enjoying the unique natural landscapes of the Pamirs Plateau in the westernmost part of the country, Liu Tongfeng completed his train trek across China in a month. Liu, 20, a junior at Heilongjiang College of Business and Technology, spent two months designing his tour route and raising money for it with a part-time job before departing at the beginning of his summer vacation. Starting from Fuyuan, he traveled west through Beijing, Shanxi, Ningxia, Gansu and Qinghai, then he arrived in Xinjiang's Kashgar. With his camera, he took more than 3,000 photos to record the 6,000-kilometer trip. "I seldom stayed in the scenic areas," said Liu, "I like walking around the alleys and lanes where the local residents congregate." "I like chatting with them and listening to their stories," he said. "The photos and the stories will be the most interesting things I can share with my classmates in the new semester." The people he met also touched him deeply during the trip. 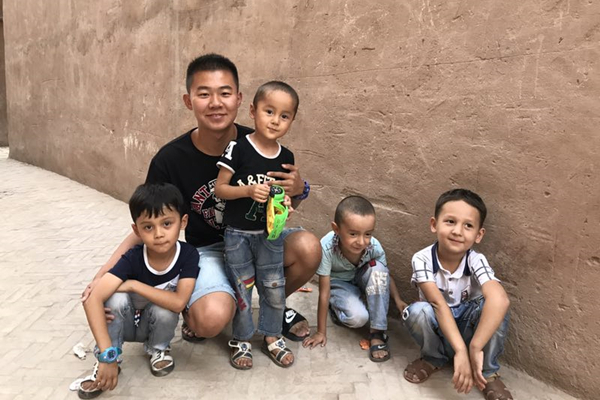 "I still remember when I arrived in a village of Guyuan, Ningxia Hui autonomous region, I felt the strong warmth of the whole village," Liu said. "The children gave me apricots they picked from the trees and the kind villagers asked me to have dinner with them." "They refused to take any money, even though they live in an economically under-developed area," he said. Travel and photography are his favorite hobbies. Before this trip, he had traveled to most parts of China since he started college. To save money, he chose to travel by train for the entire trip, except the return journey. "Usually, I would choose the night train, which would help me save money on hotels and not waste time on traveling," said Liu. "Therefore, it cost me only 6,500 yuan ($975) for the month." While still on the trip, he made plans for his upcoming winter vacation. "I want to do volunteer work at the Youth Hostel in Yunnan," he said. "I hope I can get some experience and open a Youth Hostel next year." Liu Tongfeng, a junior college student, completed his train trek across China in a month.